The Decline In The Population Growth Rate Is A Good Thing… Or Is It? We know population growth is negatively affecting our society. The environment is suffering because the high world population is raising our carbon emissions in unsustainable ways. Our trajectories for population versus food and water availability show that we won’t be able to provide for everyone on the planet. Cities and suburbs will become overcrowded and unsanitary, causing living conditions to drop and the spread of diseases to rise. It seems obvious that lowering the population growth rate should be seen as a good thing: who doesn’t want the world to remain a healthy, sustainable habitat? The twentieth century experienced the highest growth rates in all of human history, reaching 1.8% by 1970. Since then, it has dropped to around 1.14% per year. Between now and 2100, it is expected to continue dropping until it reaches nearly 0%. For environmental scientists, this seems like a fantastic prognosis, if a little too slow. For economists, on the other hand, it’s practically devastating. 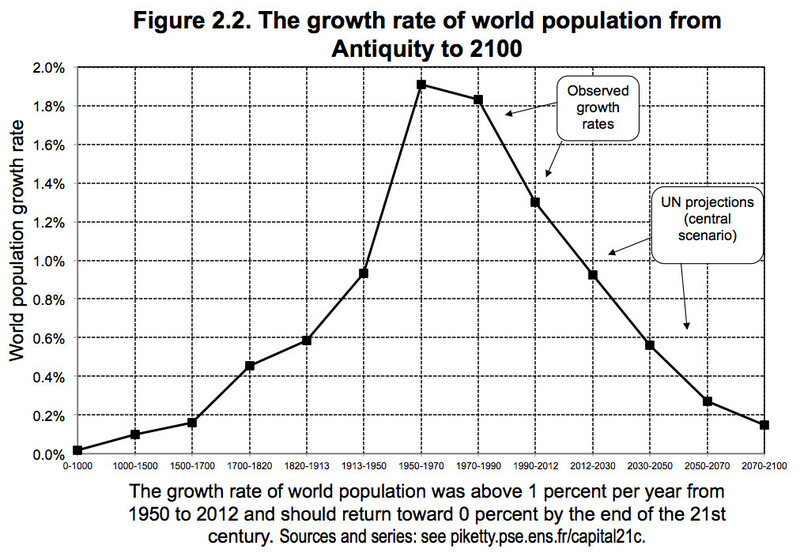 Throughout history, population growth has practically always meant economic growth. While a decline in the growth rate might help the environment, our economy could revert to one similar to that of the 18th and 19th centuries, with old money ruling and new money becoming harder and harder to procure. With economic development taking a dive along with the population growth rate, economists are becoming more worried about the world’s economic future. The last time the population growth rate decreased as quickly as it is now was during the Great Depression. The decline in the growth rate then was due to the failing economy. In that case, it was the economy causing the population dip. Yet economists also point out that population dips can cause economic downturns. Obviously, this statistic does not inspire confidence in the future of our economy. So which is more important: saving the economy or saving the environment? On one hand, a damaged economy would worsen already vast divides between the rich and the poor. Living standards would decline and “hard times” would contribute to global crime rates. On the other hand, a further damaged environment would lead to food and water shortages, a lack of resources (such as timber and oil), global warming, overcrowding, and species extinction. Personally, I think that the environmental issues are much more pressing. The economy can be stimulated by governments and individuals, but unless the population growth rate is decreased, little can be done to effectively help the environment in a comparable amount of time. It is essential that countries work to keep their TFR, which is their Total Fertility Rate, close to their RLF, or Replacement Level Fertility. This means that for each set of parents, only two children are being born to replace them when they die. If this was true for every family, then the population growth rate would be equal to zero, and the population would be constant. At this point in time, only a population growth rate of zero or negative will help the environment. Berman, Jillian. “U.S. Population Grows At Slowest Rate Since The Great Depression.” The Huffington Post. TheHuffingtonPost.com, 30 Dec. 2013. Web. 15 Sept. 2014. <http://www.huffingtonpost.com/2013/12/30/population-growth-rate_n_4520485.html&gt;. Gongloff, Mark. “The One Chart That Explains Our Grim Economic Future.” The Huffington Post. TheHuffingtonPost.com, 23 Apr. 2014. Web. 15 Sept. 2014. <http://www.huffingtonpost.com/2014/04/23/population-growth-chart_n_5198251.html&gt;. Of interest here might be the work of Bill McKibben, and of Rob Hopkins and the Transition movement– both provocative thinkers on the balances (or imbalances) you cite above. In particular, they prompt us to consider whether “economy or environment” is really a false choice. Might the economic imperative of “growth” be replaced with the more ecologically minded “resilience”– a different way about thinking about robust *and* sustainable economies?